Lina, Lina (2001) Dampak ketiadaan ayah (ayah meninggalkan keluarga) terhadap pemilihan pasangan hidup seorang perempuan. Skripsi thesis, Universitas Tarumanagara.
" Harmonious family consists of father, mother and children. Parents play important roles on child rearing. Father and mother have different roles in raising and educating their children. Secunda (1992( and Appleton (1985) stated that father's role was very important in raising and educating his daughters, and a mother could not easily replace the father's position in the family although in some cases mothers must take multiple the father's position in some cases mothers must take multiple roles in the families. Father absensce may cause omission of father image within his daughters. The absence of a father tends to stimulate feeling of insecurity of the daughters and some of the girls experience financial insecurity as well. The condition may become even worse when a father leaves the family due to conflicts in the family and not associated with conducting a specific job or duty such as in case of war. This research is aimed at finding answers on what isthe impact of father absence on his girl's behavior in finding their mates. 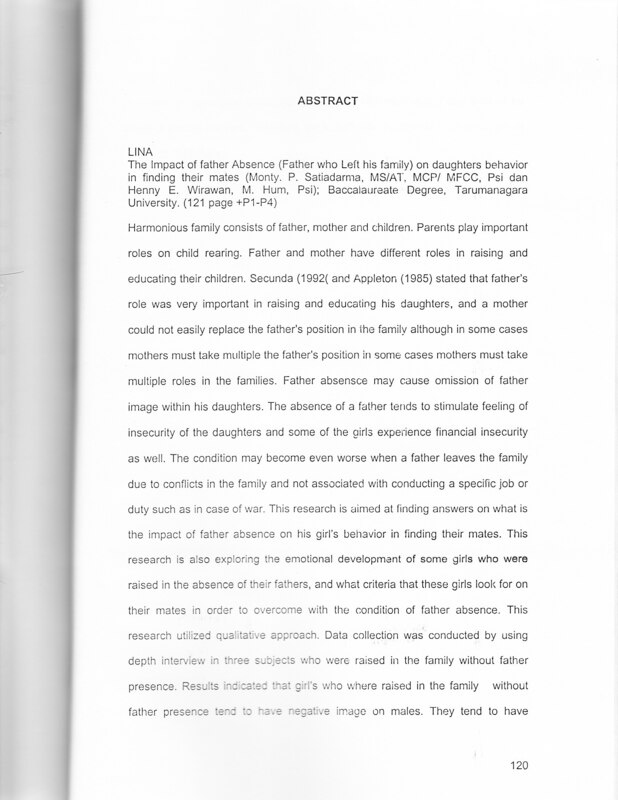 This research is also exploring the emotional development of some girls who were raised in the absence of their fathers, and what criteria that these girls look for on their mates in order to overcome with the condition of father absence. This research utilized quelitative approach. Data collection wash conducted by using depth interview in three subjects who were raised in the family without father presence. Results indicated that girl's who where raised in the family without father presence tend to have negative image on males. They tend to have problems in developing emotional relationship with their mates and tend to be afraid of getting married. Therefore, the individuals would tend to be uncertain in choosing their mates "